Tonsai Pier (Phi Phi), situated in the center of Tonsai Bay, north of of Phi Phi Don. 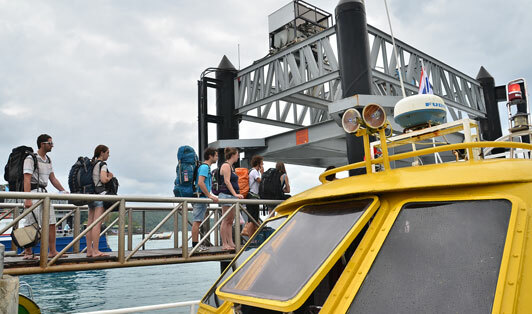 It's the island's main pier and the busiest, with ferries arriving from Phuket, Krabi and Lanta. Solidly built and so scenic with its surrounding hilly landscape. On arrival, there's a small 20 baht entry fee to the island, and you'll be met by a bunch of merchants holding up banners for tours and hotels. The pier's atmosphere is bustling, tourists and travelers everywhere, though it's much calmer once the last of the big ferries leaves at around 2:30pm. Suddenly, the charm of Tonsai Bay is apparent, with nice restaurants and tourist shops that line the streets. From here its a short 20 minute stroll to the beautiful white sands of Long Beach.